By Kristen King, M.P.S., CVEP, Manager, Virtual Solutions, Advocates for Human Potenital, Inc. 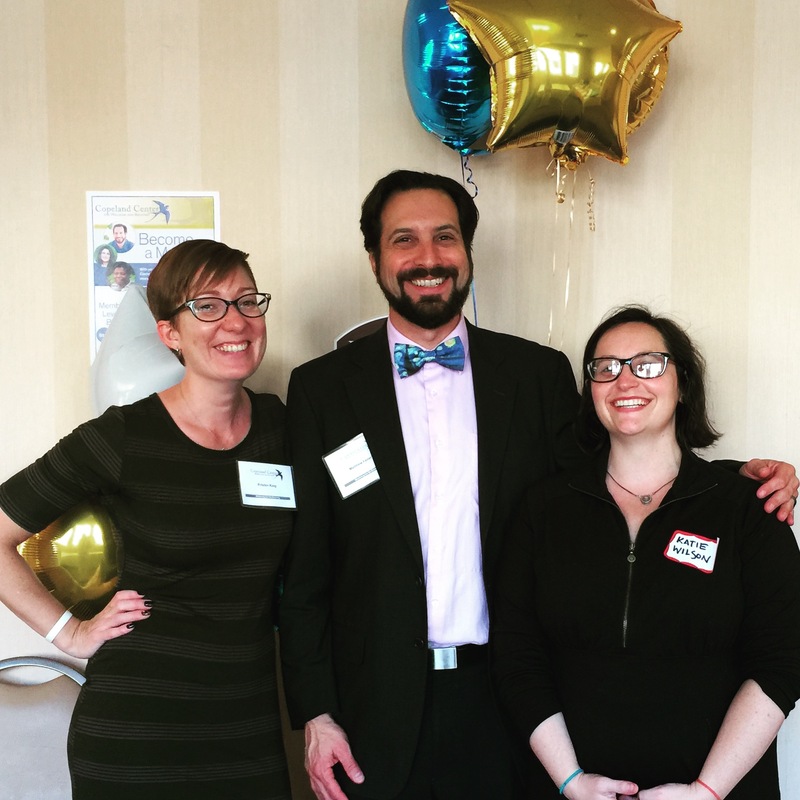 Earlier this month, I had the opportunity to attend the Copeland Center’s Mentoring for Re-Entering Summit in West Chester, Pennsylvania. Although I’ve been a fan of WRAP for many years, this was my first Copeland Center event. When I first sat down to write this article, I planned to talk about the content of the event, which was truly inspiring. But that didn’t work. Every attempt fell flat. And when I started trying to figure out why, I realized I was talking about the wrong thing entirely. The real story I need to tell about the Summit is the profound sense of community I experienced at this event. It started in the parking lot when I arrived at the hotel. A familiar-looking stranger with a familiar-sounding voice greeted me and offered to help with my suitcase—which was great because it weighed a ton and I had no idea where I was going. When he introduced himself, I realized he looked familiar because it was Matthew Federici, the executive director of the Copeland Center. My warm welcome grew even warmer when we bumped into Katie Wilson, the Copeland Center’s director of operations, in the hotel lobby. I don’t know how you can have a reunion with people you’ve never actually met before, but that’s what it felt like. I’d looked forward to meeting Matthew and Katie for years—almost as long as I’d looked forward to meeting Mary Ellen—and we’ve been spending so much time on the phone together lately that it seemed just wrong that we’d never been in the same place at the same time before. Seeing theirs as the first two faces to greet me was the perfect start to the week. Many professional events I’ve attended feel very impersonal: the speakers are the experts, the audience sits quietly and receives the information, and above all else, you Stay. On. Schedule. Mentoring for Re-Entering was a conference unlike any other I’ve attended. Everyone who presented spoke from their own experience and their own observations, and they did so with an unvarnished authenticity that invited connection. It was not Expert and Audience; it was peers learning from one another. There were 80+ people in the room during the keynotes and panels, and every one of them was engaged. A huge portion of each presentation time slot was devoted to unscripted, organic discussion. When the discussions were really meaty and engaging and ran up against the planned end of a session, everyone present weighed in and we collectively agreed to adjust the timing of breaks and the next block of sessions to accommodate folks’ interest in continuing the conversation. I don’t think I have ever felt more personally invested in a conference or more like my presence mattered; everyone was part of the event. That was the beginning of the week. The next two days, my first WRAP refresher since my initial training in 2011, blew me away. Again, it wasn’t just about the content. The experience itself was incredible. As facilitators, we all know that the completing a refresher training every 1–2 years is recommended so that we stay up to date on the best practices of delivering WRAP with fidelity to the evidence-based practice. But what people may not realize, and what I didn’t fully grasp myself, is the secondary benefit of regularly coming together with other facilitators and other people doing this work. Yes, WRAP is an evidence-based practice. And yes, for some of us, it’s part of our job. But WRAP isn’t a commodity. It’s not a membership you purchase or a thing you buy and carry around with you. It’s not in itself a job you do. WRAP is a lifestyle. It’s people coming together. It’s a shared set of values and ethics for living your life the way you want to live it and supporting others to do the same. When we attend trainings, refreshers, and events, we reconnect with the community. We reconnect with what WRAP truly is. For many of us, myself included, we may be working in isolation with WRAP. Maybe there’s not another facilitator for a hundred miles. Maybe we’re trying to bring WRAP into an area, or organization, or agency that hasn’t experienced it yet. It can be lonely at times. We can burn out without even realizing it. Refreshers do just that: They refresh us. They renew our hope. They’re a way we can take personal responsibility for staying aware and educated about WRAP and the resources, materials, and strategies available to us. They’re a way for us to gain new tools and new confidence to advocate for ourselves and for others. And they’re a way to reconnect with powerful support. Taking advantage of trainings and events is a way for us to live the five key concepts and stay connected to the community that makes WRAP what it is. Speaking of events, be sure to mark your calendar for June 5–7, 2017, when WRAP Around the World 2017 will be taking place in Sacramento, California. 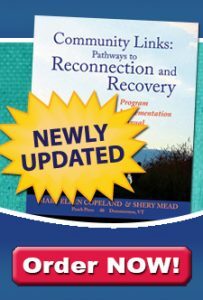 Keep an eye on the Copeland Center website for more information on lodging and the program, and watch the WRAP and Recovery Books newsletter and the Copeland Center newsletter for details about upcoming webinars, trainings, and other events online and in your area. As far back as I can remember, I’ve struggled with difficult emotions and sadness that made me feel uncomfortable. A major part of what brought me to WRAP in 2010 was deep depression. At that time, the uncomfortable feelings had become overwhelming. I’m grateful that WRAP helped me find ways to keep myself well, but even with excellent tools and support, the winter is particularly difficult for me. Less sunlight, lots of family-focused holidays with their accompanying stress, plus the anniversaries of several serious losses in my life—it’s a hard time of year for me. I know I’m not alone in this. For the month of December, WRAP and Recovery Books is offering a seasonal special to make wellness resources available at lower costs—for any purchase of $15 or more, you will receive 10% off—in hopes of helping people who may like some extra support during these winter months.